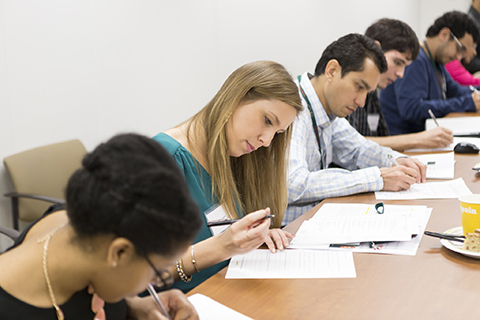 Graduate Programs in Public Health Sciences at the University of Miami Miller School of Medicine exclusively accepts applications through the Schools of Public Health Application Service (SOPHAS). Applicants must use their full name as it appears on their passport on all application materials. All application and supplementary materials, including transcripts from all institutions attended, test score(s), personal statement, resume/CV, and letters of recommendation, must be submitted online through SOPHAS. Please see SOPHAS instructions for information on submitting the required materials and contact SOPHAS directly if you have questions regarding the online application process. Start your application with SOPHAS to begin your journey to becoming a public health professional. Once the application and all supplementary materials are received by SOPHAS, it may take up to four weeks for SOPHAS to verify grades, process and deliver the verified application to the University of Miami. It is the applicant's responsibility to monitor the online checklist and status directly through SOPHAS. Applicants receive an email confirmation once the application is received by the University of Miami. Applications typically take four to six weeks to be reviewed, after completed and verified by SOPHAS. UM full-time benefitted employees receiving tuition remission are notified of their admission decision approximately one month prior to the beginning of the semester. Applicants to dual degree programs in Latin American Studies , International Administration , Public Administration , and Law must complete a second application in addition to the SOPHAS application. Please visit the program's website for additional information. Applicants to the joint four-year MD/MPH program apply through AMCAS and submit a secondary joint degree application through the medical school. Applicants should not submit an application through SOPHAS. Please visit the program's website for additional information. Please review our frequently asked questions , and then let us know if we can answer any remaining ones by email . All applicants are required to pay a fee for use of the SOPHAS application service. The fee schedule can be found here . SOPHAS provides a limited number of application fee waivers and are granted on a first come first serve basis. Please contact SOPHAS directly if you have questions regarding application fees. MPH, MSPH , and MS in Prevention Science and Community Health - Applicants must have a bachelor's degree conferred before the intended program start date. While coursework and experience in public health further enhance an application, we do not have a minimum requirement of professional experience. In addition, joint degree applicants must check with the other dual degree program regarding prerequisite course requirements. The Admissions Committee may elect to conditionally admit otherwise qualified students who do not meet these requirements and allow them to complete prerequisites during their first year. Ph.D. in Biostatistics - Applicants must meet the requirements listed for the MS in Biostatistics plus two additional courses in statistics, biostatistics, and related fields. The Admissions Committee may elect to conditionally admit otherwise qualified students who do not meet these requirements and allow them to complete prerequisites during their first year. Ph.D. in Epidemiology - This program is primarily designed for those who have completed a MPH degree, as well as for physicians and others who have a master or doctoral degree in a related discipline. At a minimum, students should have successfully completed a graduate-level foundation of epidemiology course, as well as two biostatistics courses. The Admissions Committee may elect to conditionally admit otherwise qualified students who do not meet these requirements and allow them to complete prerequisites during their first year. Ph.D. in Prevention Science and Community Health - This program is primarily designed for those who have completed a MPH, as well as for physicians and others who have a master or doctoral degree in a related discipline. At a minimum, students should have successfully completed a graduate-level foundation of epidemiology course, as well as two biostatistics courses. All official academic records including degree and certificate programs, English language programs, and incomplete coursework/degrees from all previously attended colleges and universities must be sent directly to SOPHAS for verification. Applicants with Canadian transcripts from non-English institutions should follow the international transcript instructions below. All applicants will be reviewed and considered by the Admissions Committee. There are no established minimum requirements, but the recommended minimum cumulative GPA of all college coursework is 3.0 for MPH and MSPH applicants and 3.3 for Accelerated MPH applicants. Academic performance in specific courses is also that may predict success in required MPH and MSPH courses. Applicants may be admitted with a cumulative GPA lower than 3.0 if the Admissions Committee determines that there is strong evidence of scholarly excellence from other aspects of the application to recommend acceptance (e.g., public health focus, community service, research experience, publication record, advanced degree, reputation of the training program, strong GRE performance). The average GPA of accepted applicants is 3.4. Applicants may print Official Transcript Request Form(s) through the online application. Official transcripts must be sent from the Registrar directly to SOPHAS. Photocopies of official transcripts or unofficial records will not be accepted. All non-U.S. transcripts must be evaluated by the World Education Service (WES) using the ICAP Course-by-Course evaluation service. For further instructions, visit WES-SOPHAS . Non-U.S. transcripts are evaluated exclusively through WES. Please enter your SOPHAS ID on your WES evaluation request to ensure that the evaluation electronically matches to your application. Chinese transcripts must be submitted with two original verification reports, in addition to original copies of the transcript and diploma with English translation to both WES and directly to the University of Miami . For more information please visit the WES Help Center, the China Academic Degree and Graduate Education Development Center (CDGDC) , and the China Higher Education Student Information and Career Center (CHESICC) . Applicants are required to submit GRE general test scores taken within the last five years. All applicants will be reviewed and considered by the Admissions Committee. There are no established minimum requirements, but the recommended minimum percentile for each of the verbal and quantitative sections of the GRE is the 50 th percentile. Applicants may be admitted with a GRE score below the listed criteria if the Admissions Committee determines that there is strong evidence of scholarly excellence from other aspects of the application. The average GRE of accepted applicants is 307. Alternatively, applicants to the MPH and MSPH programs can submit MCAT scores in lieu of GRE scores. The recommended minimum score of the MCAT is 24 (43 rd percentile) or greater for exams administered between January 2012 and September 2014, and 496 (39 th percentile) or greater for exams administered after April 2015. Applicants with an MCAT score of 500 (53 rd percentile) and above are considered competitive. Applicants may be admitted with an MCAT score below the listed criteria if there is strong evidence of scholarly excellence from other aspects of the application. LSAT scores are acceptable from joint degree applicants to law. Applicants to the MPH and MSPH programs who hold advanced degrees (MD, JD, Ph.D., MBBS, and other doctoral degrees) are not required to submit exam scores. All biostatistics (MS and Ph.D.) and epidemiology (Ph.D.) applicants MUST submit GRE general exam scores - no substitutions or waivers are granted. International applicants whose native language is not English are required to submit TOEFL or IELTS scores. The minimum score is 80 iBT, 550 PBT or 6.5 IELTS. The Admissions Committee may conditionally accept otherwise qualified applicants with the condition of completion of the University of Miami’s Intensive English Program . This requirement is waived for international applicants who have successfully completed 30 consecutive credits at the university level where English was the language of instruction or those who have passed the United States Medical Licensing Examinations (USMLEs). Applicants are encouraged to compose the statement in a text-only word processor, such as Notepad or TextEdit, review the statement for errors, and then cut and paste the final version into the text box of the SOPHAS application. The limit is 1,500 words. All applicants must submit a complete, up-to-date resume/CV that includes all previous and current employment, activities, leadership positions, community service, research, education and academic or professional awards or honors. Applicants should include any experiences related to the discipline they are applying to (public health, biostatistics, epidemiology), including field experience, training, education or other related qualifications with detailed summaries. All applicants are required to submit a minimum of three (3) letters of recommendation and a maximum of five (5) letters of recommendation from professionals who are best able to assess their ability to be successful in a graduate degree program. Ideally, recommenders are recent professors, researcher mentors, professionals or employers in a related field. The Admissions Office highly recommends that at least one (1) of an applicant’s letters of recommendation is written by a professor with whom they have worked closely or under whom they have studied. Applicants should request that their recommenders write a letter that is personal and specific to the discipline that they are applying to (public health, biostatistics, epidemiology). Applications will not be reviewed until this requirement is met. Applicants must list the contact information for each recommender on the SOPHAS application. Recommenders will then be sent an online form to complete via email and further instructions from SOPHAS. Form letters and recommendations written for medical school applications contribute little to an application and are strongly discouraged. Letters from family, friends or acquaintances will not be considered. After the initial review of applications, select applicants to the Ph.D. in Epidemiology and Prevention Science and Community Health programs will be invited to participate in an interview day. The Admissions Committee of each program may elect to interview any applicant by phone or Skype prior to making a final admission decision. Applicants will be contacted via email if an interview will be required. Applications are reviewed holistically on a rolling basis until all seats are filled. Please note that the earlier in an admissions cycle an application is received and reviewed, the earlier the candidate will receive a decision notification. MPH and MSPH applicants who are admitted for the Fall semester may enroll early in summer courses. Established deadlines for the Ph.D. programs are firm and late applications will not be considered. International students are encouraged to apply as soon as possible for additional processing time of international transcripts, as well as for timely receipt and processing of immigration documents. Applications for Spring 2019 and Fall 2019 will open August 17, 2018. Tours of the University of Miami Medical Campus are offered daily during the Fall and Spring semesters. To schedule a visit, please complete the Campus Visit Form . A confirmation email with details of the visit will be sent. If an applicant requires special accommodations, they should contact publichealthadmissions@miami.edu . For directions and parking information, please click here .